Part 5 Expanding the Zoom Limits. Check on the blog posts for free content that I wrote, which will be included in the ebook. This latest technique will be the third major addition to the text showing stuff not shown on my blog. Another being the fine detailed map shown last preview and in part 5. And the second being a better outline shown in the Part 6. With the outline section done, I worked on the icon customization bonus chapter which is really a more advanced manually created technique. Adding and modifying hex map icons. Here is a small picture of the section I just added to the ebook. Like I say, many will not do this, but it will be in there if need be. 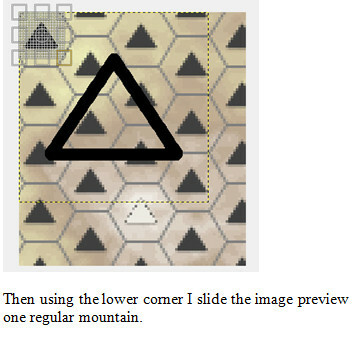 This shows me adding one of the icon symbols, a hollow triangle, replacing a solid mountain located in the snow capped peak. I am resizing the image in this screenshot. And I cut of the text halfway through the sentence.